At the last Community Board meeting he raised the issue of rubbish being dumped at the beach area, after being astonished to find much of the litter could have been responsibly recycled. “Over 80% of the rubbish in the picture could have been recycled for free. The value of the goods which were identifiable in the rubbish was $616 with most purchased recently. So the person responsible was certainly not someone poor who couldn’t afford to pay for its disposal. “Plus, the cost of a rubbish bag has come down since the private operators have come into the market. “As a community we take pride in how our town looks and if anyone sees this happening they should note the car registration number and report to Council. “We must discourage people from doing this and issue infringement notices where possible,” he said. 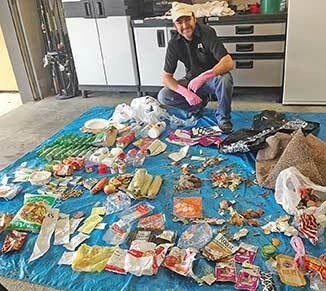 James Cootes with the contents of one rubbish bag that was left at Ōtaki Beach.